"Can´t live with them, can´t live without them!" 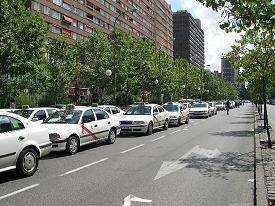 is very true of Madrid taxi companies. Whilst they are a menace to anyone driving in the city, we all need them after an evening out on the town or simply getting to and from the airport. Madrids Taxi drivers have their own little quirks,which is probably only natural considering the 12 hour shifts! Despite the long hours taxis are very rarely involved in accidents and even when they are, it tends only to be a small bump ..... as the Madrid traffic does not permit high speeds....anywhere! In the event that you need to book a taxi the following are the principal companies. Taxis cannot be booked to collect you at the Airport or Train stations. Fares start from when the Taxi driver drops his last passenger and comes to collect you. All numbers have Spanish operators. Taxis are painted white with a red stripe on either front door. Except for in the airport on arrival, see here for Madrid Taxi airport details , you will "hail" a taxi in the time honoured fashion by raising your arm, waving it madly and stepping about three feet into the road. Do watch out though as the regular driver in Madrid is a special breed... which you will find out! Green light - Positioned on the roof of the Taxi when Green the Taxi is available. If you cannot see the light, sometimes difficult in summer, raise your arm anyway as it can not hurt. Placard - A reversable placard is shown in the front windscreen on the passenger passenger side. Showing LIBRE means the taxi is empty. Showing OCCUPADO means the taxi is....well... occupied! Finally there is a 3rd placard that is sometimes shown. This will be in red and show the destination of the Taxi. The Green light will be on and the taxi is therefore available but only to the destination stated. This is for when the taxi driver has had enough and wants to go home! Its difficult to cover all eventualities but included here is an idea of what you may expect to pay for your Madrid taxi. Please do not take these as "gospel" and remember that every Jan 1st the rate structure changes! Supplements - These are always added to the Metered fare at the end of the jouney. Supplements are applicable for the following start or finish points of a journey. NOTE: For journeys starting and ending in one of these places the supplement of the start and finish point will be applied, ie two supplements. Residents Tip: If you think the fare being charged is not correct ask for an itemised receipt with any supplements shown and the taxi number: "Factura con todo los campos rellanado y numero de taxi". This can then be submitted to the Madrid council who will investigate and possibly refund you!